Illinois Institute of Technology (IIT) and Chicago Council on Science and Technology (C2ST), along with our academic and corporate partners, cosponsored a symposium during April 21-22, 2010 on four areas related to several of the 14 Grand Challenges: clean water; carbon, energy and climate; urban sustainability; and global health. 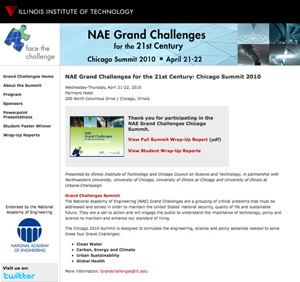 The Chicago Summit is part of a nationwide debate on the Grand Challenges, with symposia on other topics related to the Grand Challenges held across the country. Videos of the event are presented below. Read the event report and recommendations. The entire partnership team included: Illinois Institute of Technology and Chicago Council on Science and Technology, in partnership with Northwestern University, University of Chicago, University of Illinois at Chicago and University of Illinois at Urbana-Champaign. Moderator: Bill Kurtis, A&E hot, Producer and Narrator, "Cold Case Files" and "American Justice"
Norbert G. Riedel, Corporate Vice President and Chief Scientific Officer, Baxter International Inc.